We’ve been down to our woods a lot recently, to finish off our work thinning a plot of Corsican pines so that we may receive a European subsidy. With keen eyes, we’ve noticed that we’re not the only ones there. First off was a sluggish little beetle that we inadvertently uncovered. After a couple of snapshots for the blog, we relocated him/her to what we thought to be a similarly sheltered spot to let him get back to his/her hibernation. 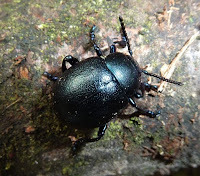 As far as I can tell from my Collins Gem Insects, it is a Bloody-nosed Beetle, Timarcha tenebricosa but I’ll be interested to hear from anyone who can either confirm that or tell me otherwise. It apparently has this name for its habit of exuding a red fluid from its mouth when alarmed. We know there are wild boar in the area; Gabrielle and I saw a mother followed by three piglets cross the road in front of the wood very late one evening a couple of years ago. And here’s evidence of them in the wood: a pine tree that’s been used as a rubbing post. The ground beneath it has been “poached” by the boar walking on it and the bark has been completely rubbed off, all around the tree, leaving smears of dry mud on the trunk. 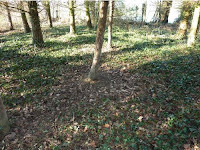 Another time, as we walked in, woods, there was a cracking of undergrowth and a flash of russet brown as a startled a group of five chevreuil (roe deer) made off. 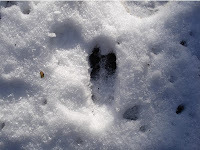 The snow we had last month made it a lot easier to see animal tracks and I believe this print is of a roe deer. And last but not least, yesterday’s visitor was Laurent Girard of the Centre Régional de Propriété Forestière, come to cast an expert eye over the work we’d been carrying out. He’s ticked the boxes and signed the form, so we will get our subsidy. Thanks again to our friends and volunteers who helped: Kristen, Jérémie, Debbie and Stuart, Graham, Liam, Paul and Chay. 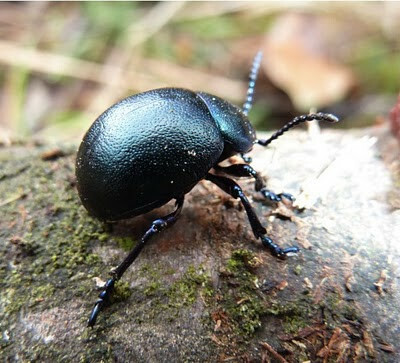 Yes Pete confirms your beetle is what you thought and also said they are quite rare! It's good to hear some more follow-up information from the woodland endeavors. I'm glad you got the subvention - everyone wins. I'll be off to Tinker's Bubble, in a few days, to do a week or so of woodland work there. I've been meaning to visit there for a long time. 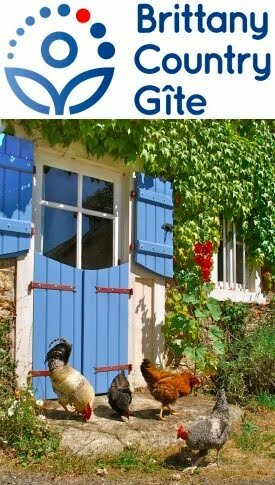 While I'm at it - I know August 2011 is a long time ahead - but the huge, world-renowned, long-distance, cycling event Paris/Brest/Paris will be passing through Medreac for a number of days. You might use this to target your advertising for accommodation : get involved in the volunteering activities : or just stay well clear !! Stages 5 & 10 on the map - the riders will take whole days & nights to pass through on both the outward & return legs.